The Iron Age fortifications on Carn Brea were excavated in 1895 by Thurstan Peter and a group of local labourers. This photograph shows two of those labourers, George Blight and Jim Thomas, and was taken at the time the excavations were taking place. The West Briton of the 4th of April of that year commented: "The expectation seems to be that some ancient relics of the Britons or Romans may be unearthed. The only remains discovered up to the present are some stone heads that might have been spear heads. The explorations at present are three or four large pits about fifteen or sixteen inches deep and about twenty feet in diameter. They have been dug near the upright stones that seem to indicate the position of some old stone circles." Hut circles were indeed later found, thanks to Thurstan Peter's eagle-eyed young daughter, and a later edition of the same newspaper reported that two hundredweight of finds had been made on the site.1 Image courtesy of and © David Thomas. 1. Tangye, Michael. 1981. 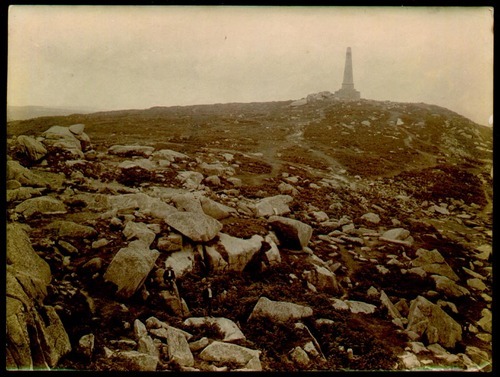 Carn Brea: A Brief History and Guide. Dyllansow Truran.